WESLACO — School district officials here have estimated $13.7 million in repairs needed as a result of last month’s flooding. The Weslaco school district board of trustees held a special meeting Thursday morning for an update on the June 20 floods that left the district short 89 school buses and required the closure of one elementary school, among many other damages to schools and district property. Officials are now working to rezone students and rush purchase orders to comply with the soon-to-be-needed transportation demands. District officials presented the plan to rezone 521 students from F.D. Roosevelt Elementary School, which suffered damage currently estimated at $5.8 million. The school will not be ready by Aug. 27 — the beginning of the 2018-19 school year — nor the spring semester, according to Superintendent Priscilla Canales. The plan so far is to move 395 students and 21 teachers to Airport Elementary School, as well as 126 students and eight teachers to PFC Mario Ybarra Elementary. These are the schools with available capacity that were closer to the areas originally zoned to Roosevelt Elementary, officials said. The district will also be rerouting funding and additional support necessary to house these students and teachers at the two elementary schools. This campus’ cafeteria must be rebuilt, as well as its library and two main buildings. One of the main issues with the campus, which is located at 814 E. Plaza, is that it sits on land that is lower than the level of the street, which contributed to the nearly 3 feet of water that damaged the campus. School officials said the company assessing the construction project, Gerloff Company Inc., estimates this campus being completed by January or February 2019. But at least two of the buildings, including the cafeteria, should be operational by the beginning of the 2018-19 school year. A letter notifying parents of children previously zoned to Roosevelt Elementary was sent Thursday, Canales said. 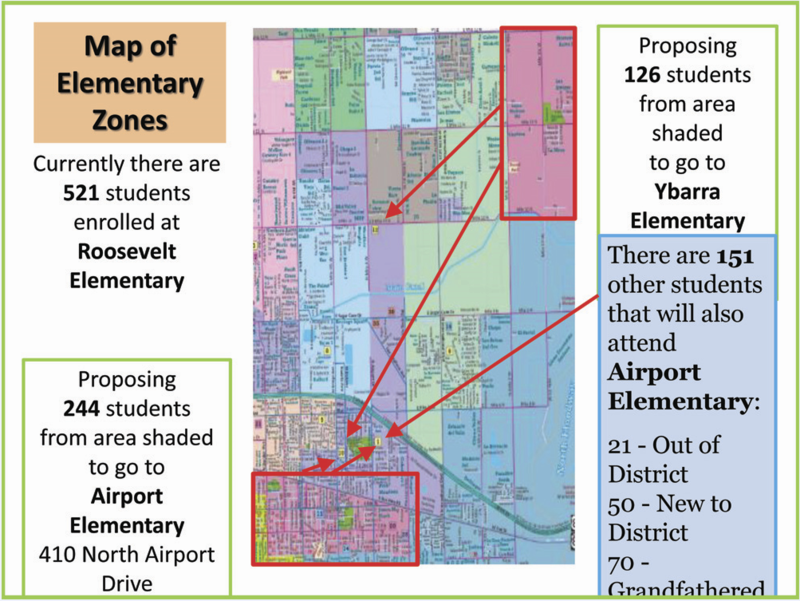 Now that the zones have been determined, the transportation department will work to assign pick-up and drop-off areas to accommodate the rezoned students. Parents will be notified as more details become available, Canales said. Transportation was one of the hardest-hit departments in the district with 89 school buses recently deemed a total loss out of a fleet of 91 buses, as presented Thursday. 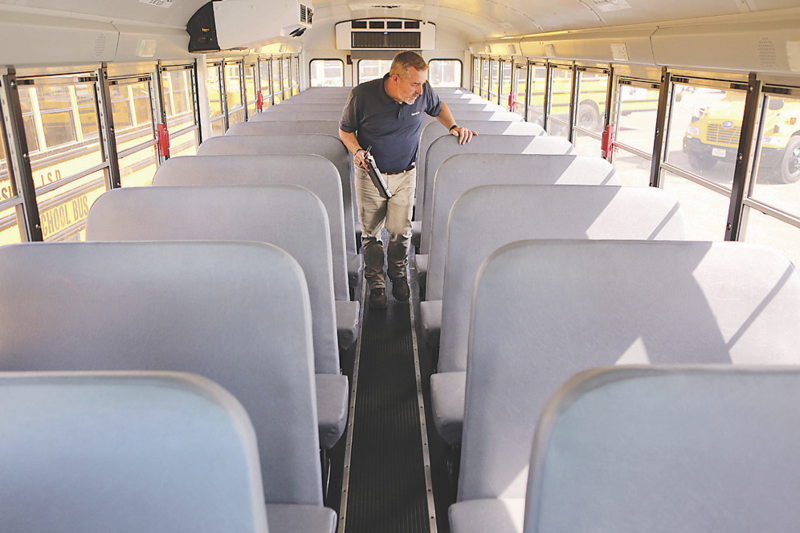 Officials have approved several purchase orders totaling about $6 million for 63 buses coming out of the district’s fund balance. These are scheduled to be received by the first week of August in order to be fully operational by the first day of school. Officials had originally estimated that 61 buses were inoperable, but insurance adjusters visited the transportation department last week to assess the damage. On Thursday, they said the insurance company has yet to notify the district of how much money they will receive for the total-loss vehicles. 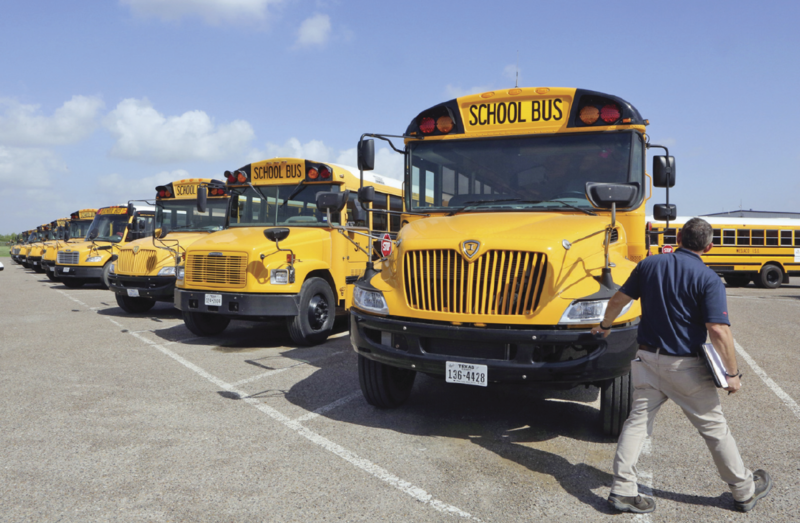 The district was allowed, however, to keep 29 of the total-loss buses to repair, and Transportation Director Lupe Garcia said eight are near completion. The overall damage to the transportation department has thus far been estimated at $6.8 million. Other areas highly impacted include the maintenance department, which will need to replace several vehicles and supplies for an estimated $500,000; the district warehouse where the total cost of contents lost has thus far reached $527,605; and Weslaco East High School’s Gym, where repairs mostly include flooring at an estimated $120,000. Damage to district technology alone has now reached $99,439. One of the first steps taken by officials was to estimate the number of families, students and staff affected by the floods. These numbers reached a total of 2,132 family homes in the worst-hit areas, a total of 3,490 students affected and 59 staff members also impacted. The district is working with the city to keep track of any federal help that might become available through the Federal Emergency Management Agency. In the meantime, however, the board also approved a resolution allowing district officials to borrow anywhere between $10 to $15 million if needed to cover emergency purchases and replenish the fund balance. Officials clarified, however, that this is just permission to borrow and the district has not yet acquired any loans.